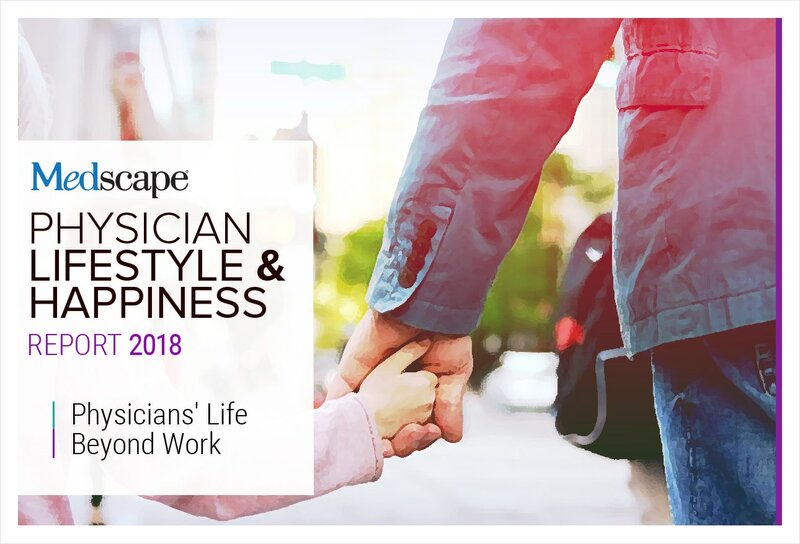 This report is based on Medscape's annual physician lifestyle survey, which asked doctors about their lifestyles and experience with burnout and depression. More than 15,000 physicians from 29 specialties participated this year. The current report covers such lifestyle issues as exercise, weight, religion, work satisfaction, and choice of car. Some totals in this presentation do not equal 100% due to rounding. Physicians were asked to rank their happiness outside of work on a scale of 1 (extremely unhappy) to 7 (extremely happy). Half of physicians are very or extremely happy, while just 10% are extremely or very unhappy. Allergists, dermatologists, emergency medicine physicians, and ophthalmologists are among the happiest outside of work. Cardiologists, public health physicians, and oncologists are among the least happy. When asked whether they have spiritual or religious beliefs, nearly three quarters (73%) of physicians claimed that they do, while only 27% said they do not. Of note, in the 2012 Medscape Lifestyle Report, (see slide 17) 83% of physicians said they had a belief system. When respondents with a belief system were asked whether it helps them cope with work stress, 76% answered "yes." According to the Mayo Clinic, spirituality has many benefits for mental health and overall stress relief. Physicians were asked to grade their own introversion or extroversion on a scale of 1 (very introverted) to 7 (very extroverted). Over a third (38%) fell in the middle or leaned toward introversion (35%), while just over a quarter (28%) tended to be more extroverted. Public health physicians, pathologists, and rheumatologists are among the most introverted physicians, according to our survey results. According to the results of our survey, surgeons, urologists, ob/gyns, and gastroenterologists are among the most extroverted physicians. Most physicians are currently in a committed relationship, with 82% married or living with a partner. A much smaller percentage are single (11%) or divorced and not currently remarried (5%). When it comes to choosing a spouse, nearly a quarter of physicians marry within the healthcare field. Twenty-one percent of respondents reported that they are married to another physician, while 26% have a spouse who is not a physician but is in the healthcare field. More men than women are married to someone within healthcare. Nearly two thirds (64%) of women said they married outside of the healthcare field compared with less than half (48%) of men. More than half of physicians said they have three or fewer close friends, and about a third said four to six. A gregarious 15% reported having seven or more. Pathologists, intensivists, radiologists, and anesthesiologists are among the physicians most likely to say they have three or fewer close friends. Nearly half (49%) of physicians surveyed take 3 to 4 weeks of vacation per year, and 18% take even more. Still, a third of respondents said they take 2 weeks or less. Employed physicians take slightly more vacation time than those who are self-employed: 69% of employed physicians take 3 or more weeks off each year compared with 63% of their self-employed peers. Physicians were asked what cars they drive; they could choose as many as applied. Toyota is by far the most popular car among physicians. Honda follows, with other makes falling considerably behind. Among both primary care physicians and specialists, the leading makes are Toyota and Honda. BMW was third among specialists, followed by Lexus and Mercedes-Benz. Fewer primary care physicians drove these cars. Nearly half of physicians said they want to lose weight, and about a third (32%) said they are trying to maintain their weight. Only 19% reported that they are not doing anything to control their weight, and just 2% would like to gain weight. Given societal pressures, it is not surprising that a somewhat higher percentage of female physicians reported trying to lose weight (52% vs 45% of men). A slightly higher percentage of men than women, however, said they are striving to maintain their current weight (34% vs 29%). The Office of Disease Prevention and Health Promotion recommends 2.5 hours of moderate exercise or an hour and 15 minutes of vigorous activity per week. Nearly a fourth (21%) of physicians said they exercise once a week or less, while 11% say they don't exercise at all. Just over one third (35%) of respondents said they exercise two to three times a week, however, and the remainder even more often. Many physicians tend not to drink much, with nearly half (49%) claiming that they have less than one drink (27%) per week and 22% not drinking at all. Only 8% reported that they have seven or more drinks each week. Mayo Clinic Staff. Spirituality and stress relief: Make the connection. April 23, 2016. https://www.mayoclinic.org/healthy-lifestyle/stress-management/in-depth/stress-relief/art-20044464 Accessed November 20, 2017. Office of Disease Prevention and Health Promotion. Physical Activity Guidelines for Americans. https://health.gov/paguidelines/guidelines/ Accessed November 27, 2017.